In every episode of Martha Stewart’s Cooking School, learn cooking fundamentals following Martha’s signature step-by-step, how-to teaching process. Be sure to check your local listings to see when this episode will be airing in your area. If you love to eat seafood but balk at preparing it at home, you’ll welcome this lesson. Dave Pasternack, a renowned seafood chef based in New York City, joins Martha for a beginner’s class on buying, butchering, and storing fish. They then demystify how to bone a round or flat fish and how to clean a squid. Finally, Dave shares an easy-to-prepare recipe for crudo, his signature dish. 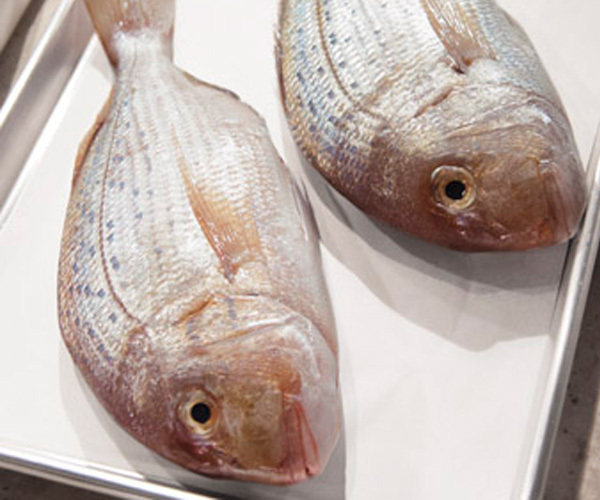 Dave Pasternack, a renowned seafood chef based in New York City, joins Martha for a beginner’s class on buying, butchering, and storing fish. They then demystify how to bone a round or flat fish and how to clean a squid. Finally, Dave shares an easy-to-prepare recipe for crudo, his signature dish. What are the signs of a healthy fish? Martha Stewart says to look for clear and bulging eyes for fresh fish. This fluke crudo recipe appear in the "Fishmonger" episode of Martha Stewart's Cooking School. Arrange half of the fish on each of two serving plates. Sprinkle with radish, and season with salt and pepper. Drizzle with olive oil and lime juice. Can't wait to try the recipe out. We had an OK harvest last year, not enough to can, but if I get enough this year, I have them on the Fall agenda. Okay, good to know. I thought maybe the screw-ups had to do with rolling it out or baking time or something.